We aim to be different from all the other properties on here by treating you the way we would like to be treated ourselves,with excellent customer service and no hidden costs. Villa Rosa is a re-modernised 1300 's villa,situated 10 minutes above, the historical spa town of Bagni Di Lucca. Our location has the best of both worlds. Being in a small, quite hamlet and at the same time, reachable from Pisa Airport in little over an hour. With the our regional capital of Lucca, around 30 minutes away. From our first reply to your initial email enquiry, to the day you leave the villa, our mission is to make dealing and staying with us, the best Tuscany Villa experience that you will ever have. Simple We treat people the same way we want to be treated when we go on holiday ourselves. You can read about our excellent customer service in the reviews people have kindly let us. We aim to reply back within the hour to most enquires during central european times.This means your not hanging around waiting to hear back.We also offer a FREE call back service to make the whole booking process more personal and help ease any worries you may have regarding booking on line. Any questions future visitors may have are thus answered quickly and professionally. Our team can speak fluently in English, French Spanish and Italian and we won't be happy until your 100% that we are the best place for you to come and stay. The Villa is 75 minutes from Pisa & Florence Airport & 35 minutes from Lucca,the provincial capital. The beauty of its location provides the opportunity for total tourism all year round; with the Tuscan Rivera an hour by car & the ski slopes of Abetone are 35 minutes away. Ideal for walkers and those looking for mountain adventure, you can walk from 100 metres above sea level to nearly 1,300 metres above sea. Mountain biking, road cycling and moto cross, are all popular sports in the area as well. La Lima river also provides a great back drop for white water rafting and fishing. After your exercise why not visit the roman spa,10 minutes away in Bagni di Lucca.Everything from an excellent steam to the famous mud treatments. Looking for great food? You won't be disappointed, with everything from family run trattoria's with 10 euro lunch menu's to michelin graded restaurants, for that special occasion. For those needing internet facilities,Villa Rosa has excellent, FREE Wi Fi Internet, with a new large 8.5m x 4m pool. This is separate to the villa, in a gated area (as the law dictates),surrounded by our Tuscan orchard/garden. It offers comfort & relaxation in abundance; with 2 large doubles, a medium double & quad room combination (a double and 2 singles), with two large bathrooms; one on the ground and on the other on the 1st floor.We have also added a Taschen books reference collection. There is simply too much to do in the area and one visit or week is never enough. From cooking courses at the villa, to walking and water rafting to sampling the local wine and olive oil, you can fill your days quickly. For the most up to day information please visit the official Tuscany and Lucca tourist information sites. We are a family group that has owned the property since 1325. It entered our family possession as a reward for excellent service at the Battle of Altopascio where Lucca defeated Florence. After Rosina or Rosa passed away a few years ago we thought about what we could do with the property.We saw these non locals coming in and renting properties and thought not only could we do a BETTER job but also be more competitive as well. With a family business and customer focused background, totalling over 200 years, we aim to provide the best Tuscany holiday you can experience. It is easier to explain why we did not go for a property in Bagni di Lucca itself. Before we re-modernised Villa Rosa we looked at investing in Bagni. It didn't offer what we thought was a true Tuscan Village/hamlet experience, that we new our future guests would prefer. Plus the views at the bottom of our valley are quite limited and constrained.So therefore our choice of location and property were ideal because it was close to Bagni but offered so much more in terms of relaxation, enjoyment and amazing upper valleys views. Also by basing ourselves 10 minutes driving up the valley, we gain the cooling effect of our Prato Fiorito, mountain breezes. Come and find out for yourselves. Villa Rosa has the best of both words for those that want the Villa in the country side but also know its perfectly placed to take advantage of amenities of a village shop and grocery store only 8 minutes walk away.You are also well placed to drive to supermarkets and hypermarkets from 10 to 25 minutes away.It has space for large family groups and is also perfectly suited for the single writer or producer looking for that piece and quite to think things through.We have fitted a fantastic NATO graded wifi. None of this cueing up up at the local tourist office, to keep abreast of whats going on.The villa is open all year round and with central heating throughout the property you will feel warm and snug throughout the winter months.In the summer, our large swimming pool allows guests to cool down and chill-out in the orchard garden. Here they will experience the total piece and relaxation, of the beautiful Northern Tuscany countryside, that is the Lima Valley. 2 Public car parking areas and a private field are available. All 3 areas are within walking distance of the villa. Open plan across kitchen and coffee area with a further dinning area situated on the balcony. You can Kayak/ Canoe in the valley depending on the time of year. 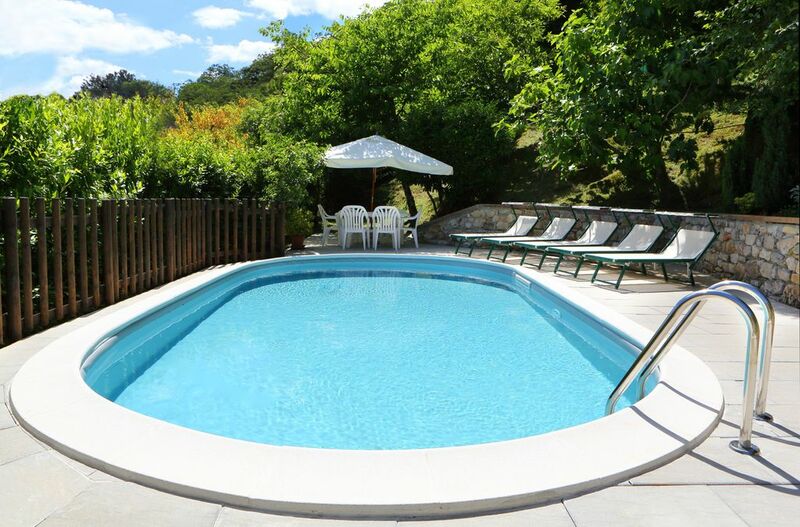 The private pool is situated in a separate gated area to the left of Villa Rosa. Wi Fi Internet fitted. Our new pool area has been finished and as you can see offers views of the Lima Valley. It is situated in the Villa Rosa Garden, surrounded by our fig, pear and apple trees with natural flowering plants. The 8.5m x 4m new pool (2015), was positioned to take advantage of the summer sun, which receives between 8-10 hours of sunlight during the summer.It also has 5 aluminium beach loungers for your added comfort. There is also a garden balcony area with garden furniture for breakfast,lunch or dinner Al Fresco. This area has flowering plants & our vines which we harvest in September for our own estate vine production. Villa Rosa is traditionally built over 2 floors with a total area of 220 sq metres. We have added the balcony area in this calculation because some places do and some places don't include this area. For interior space we are around the 190 sq meters. Marble & local stone flooring mean easy cleaning and cool interiors. We were happy to have you come and stay and are glad you had a great time. I am a writer based in London and every Spring, for the past 10 years, I choose a typical writer's property, for some work and r&r. It must have room for a maximum of 10, have charm, good features, be clean with a great kitchen.Together with amazing views, for inspiration. Not forgetting excellent wifi. Villa Rosa has all those and much,much more. I had been to Firenze in my youth. However I was interested in exploring another part of Tuscany. I thus decided upon the Lucca area, since it offered the best of everything. I emailed plenty of properties with many sadley not even replying back. Thats something thats not the case, with the Villa Rosa Tuscany Team. I emailed them at around 3 am their time and within 30 minutes I had received a reply! Part of the actual booking process they use, is to call you up. Its a great idea and gives both parties, the chance to get to introduce themselves. A member of the team explained. "By calling, we try and make sure that we are the right property for the group, wanting to come and stay. You want the customer to be happy before he's even arrived. That starts by offering excellent customer service, from the moment we recieve your enquiry to the day you leave us." After a 25 minute chat I was certain that Villa Rosa was the place for me and my mixed group. So I decided to confirm there and then. With the booking complete, I recieved Villa Rosa's full directions and advice on local places to visit and eat.This was very thorough, around 20 pages long and also included Google map links. On arrival Villa Rosa, was as exactly as advertised, clean, spotless with fantastic views from the balcony, over the hamlet and valley. I had asked the Villa Rosa team to do me a grocery shop and my fridge was full Tuscan steak, sausage, fresh fruit and vegetables and cake. I also received with the compliments of Villa Rosa, 2 delicious D.O.C certiffied bottles of wine, which I thought was a lovely welcoming touch. Over the next 3 weeks, Villa Rosa was the perfect location for friends and family to come and stay. We all loved the place and facilities and could not have had a better time. We especially enjoyed the spa in Bagni di Lucca and the trattoria restaurant in the village, which you could get to by walking in about 8 minutes. A final big thank you to all the Villa Rosa Tuscany team, for making our stay very enjoyable and memorable. Thanks for a fantastic review. It means so much that you and your party had a lovely time with us. Spring came early and with the temperature touching 25 degrees centigrade, our part of Tuscany was perfect. We are glad that you appreciated our phone call and reservation process. We know how un-personal the internet can be. So we always try and make the reservation process as friendly as possible. At the same time, we want people to be 100% that we are the right villa for them. The food shopping service is becoming a more and more popular option. When people are arriving quite late, they often cannot go shopping. Thus knowing that you have a quality food shop already waiting for at the Villa, is a huge benefit. Plus we always provide 2 good bottles of wine with out compliments so that you can enjoy them on the balcony and start your holiday the best way possible. We finally wanted to thank you for rebooking a summer week with us and know you will love the private pool when you return. A Villa with a view! Having just returned from a relaxing week at Villa Rosa I can't rate the villa and management team any higher. From first booking to deposit refund everything ran like clockwork. A beautiful, well equipped villa offering everything that our family needed (2adults, 2 kids - 19 & 17). The journey up the mountain in the dark was a little hair raising at times so I would recommend timing flights better than we did, but the directions sent by the Villa Rosa team were excellent, just try to absorb them before you set off. Despite being on the side of a mountain in a small village in the middle of the countryside the wifi speed was exceptional - you know how important that is with mature kids! The views are stunning and you can't beat sitting on the balcony with a glass of wine just watching the world go by. The pool was brilliant, private and just the right size, although in September it took a while to get heated by the sun, although once you braved getting in it was lovely. We planned to relax this holiday and this was very easily done. We travelled a little to Pisa (which was much nicer than I had been led to believe and you can't go to Pisa without taking the obligatory holding up the tower picture. Parking costs are surprisingly cheap (60 cents and hour) here so I would suggest getting as near to the centre here as you can, paying for a decent length of time and having a Pizza in Pisa. Lucca is beautiful and we definitely need to go back there, if only to parade around the walls in the evening with the locals, never seen so many joggers, dog walkers and cyclists in one place. Bagni di Lucca Is a perfect distance to stock up on all your essentials but the local general store has everything you need if you don't want to travel much. The village quite literally consists of one church, one general store, a butchers next door (lovely sausages and fresh chicken) and across the road a pub/cafe/restaurant and that's your lot - perfect, what more could you need. The villagers are very friendly but it helps massively if you can speak some Italian or are at least willing to try. Overall a lovely villa, in a lovely location, with an excellent management team, who we found were willing to go that one step further than other villa owners when it came to providing a wonderful holiday experience. What more could you ask for. Villa Rosa is a fantastic experience. The whole family loved it and we used the pool every day which the kids especially loved. The whole place had something magical about it, very spacious, clean and well equipped too. Quiet, relaxing and an awesome view from up the mountain. Villa Rosa, located high in the Tuscan mountains and yet just a 40 minute drive from beautiful Lucca, is a hidden gem that all of our 4 children/ 4 adult party declared to be the highlight of our stay in Italy. The Villa Rosa team has thought of everything - every modern convenience you could want from dishwasher to barbecue all tastefully within the centuries old home - amazing! The brand new pool was immaculate and a wonderful way to cool down after whatever excursion we headed out to for the day. The local butcher and Elena's grocery store were a daily visit - we have never had better sausages in our lives! When we managed to lock ourselves out of the house the first day of our stay, one of the Villa Rosa team had us back inside within minutes. From the first communication, through the booking process, through all our various questions, the Villa Rosa team was happy to take the time to answer all of our queries. The detailed emails were invaluable in reaching the rental home especially when it came to parking the car. We would advise the use of Google maps GPS as we didn't get lost once while coming from Verona to Villa Rosa, and it would have been tricky without it. We just wish we had had 2 weeks to stay at Villa Rosa - next time! Villa Rosa is everything one could hope for and more! We were a group of 8 ranging in age from 7 to 69 and this property offered something for everyone! From the moment we arrived, we were overwhelmed by the beauty of the villa as well as the surroundings. Walking out onto the private terrace overlooking the small village and taking in the incredible mountain views - well, there are almost no words to describe it. The home is incredibly well-appointed - the kitchen and amenities (including a barbecue which we used daily) are a dream. Providing meals for 8 was easy with everything that this home has to offer! The Villa Avesa Team has thought of everything one would need to make a vacation both relaxing and comfortable! The bedrooms are all wonderful sizes and provide beautiful views of the surroundings. The two bathrooms, one upstairs and one on the main floor, were the ideal layout for our large family! The pool is lovely and so well-maintained. It is very private and served as the perfect ending to a day of touring local sites! The Villa Avesa Team was easy to communicate with and provided all necessary information prior to our arrival! We felt very much at home right from the start because of all the wonderful information we were given. We managed to lock ourselves out one afternoon from the villa and it wasn't five minutes later, that we were let back in by one of the Villa Avesa's wonderful team! Talk about service!! If you are considering a visit to this area, look no further than the Villa Avesa! Between the incredible service the team offered us and one of the most beautiful villa I have ever set eyes on, you will not be disappointed with your choice! There is something truly magical about this place! Thank you for a super review.You have described our Villa so well, its the kind of review thats worth its wait in gold. We cannot add to it anymore.We are especially proud of treating people the way seasoned travellers like ourselves prefer to be treated.Which makes a world of difference when compared to other properties.Thank you again. Situated at 550 feet above sea level, Villa Rosa ,offers gorgeous views of the Lima Valley. Bagni Di Lucca is the nearest small town, where one can purchase almost anything you might need. Including open air fresh food market on Wednesdays and Saturdays. Plenty of bars & restaurants can be visited with excellent tourist menus for 10 euros. Local activities are many & wide spread,(see list below). Why not start planing your late summer/autumn/winter trips.Come celebrate the wine & autumn chestnut harvest. Skiing?Villa Rosa is only 40 minutes from the biggest skiing area south of the Italian Alps at Abetone. A hidden gem away from the heard! Golf: There is a golf course in Montecatini: 40 minutes drive away. Ski: Villa Rosa and Casa Bruno are situated only 40 minutes driving from Abetone ski resort, which is open from December to April.It is not only the biggest resort south of the Italian Alps but also the biggest Apennine resort. Located in a state forest on the Modena to San Marcello Road near the border between Tuscany and Emilia Romagna, with ski access points at Faidello (1220m) Abetone (1400m) Le Regine (1200m) Plan di Novello (1150m) and Cutigliano (733m). There are 54 lifts over this wide area with 27 at Abetone itself, including many chairs. These access an extensive network of mixed-ability pistes above and below the tree-line. The highest point (Monte Gomito) is 1940m. 20 kilometers of ski slopes have snow making facilities. Abetone has 2 ski schools. Please visit www.abetone.com for more information. We have different pricing for larger groups and/or with more bedrooms occupied. With regard to extra charges for different group sizes above. We do not charge individual increases for each person but work on increments of up to 2 for each increase. (Unfortunately home-away system only shows increases charged per person). If a group requires an extra bedroom than what the price classification is for, then its an additional £100. If 9 people are staying, an additional £100 is charged. If 10 people are staying, the additional charge is still £100 All payments are in British pounds sterling. (£) Please use your trusted currency converter to work out your exact cost for your own currency We reserve the right to increase rates for any group & any number of persons that go beyond the specified group date & group size. Pay pal/international banking charges will be added to the total cost To offer the Villa at more competitive rates for smaller groups, if in the "Rate Period" description section you see either "2 Bedrooms" or "3 bedrooms", this means that only 2 or 3 bedrooms out of the 4 total will be prepared. If a 3 day price is advertised for a specific smaller group and a larger group wants to come and stay then pricing reverts back to a 7 night stay. Heating costs if needed are NOT included in the above utility costs at an additional £120 per week The person "in charge" of making the reservatation, is responsible for making sure Villa Rosa's location and facilities match the whole groups needs.